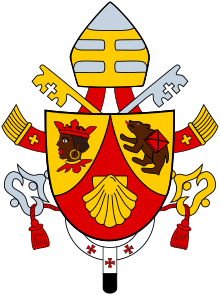 ^ Coat of Arms of His Holiness Benedict XVI. 梵蒂岡官網. ^ 2.0 2.1 本篤十六世牧徽 傳統象徵注入新意. 普世教會　第3192期. [2013-04-12]. ^ The bear and the scallop-shell — a unique papal coat of arms. Catholic World News. 27 April 2005 [5 January 2007]. ^ 5.0 5.1 Glatz, Carol. Pope drops papal crown from coat of arms, adds miter, pallium. Catholic News Service. 2005-05-18 [2012-03-23]. The Coat of Arms of His Holiness Benedict XVI. Vatican. [May 28, 2005]. Benedict XVI's Coat of Arms. EWTN. [May 18, 2005].